Sunday, October 5, 2011. Another new pastor for Reconciler. Still no consultation. Sunday, October 5, 2011. It was announced during worship at Highlands UMC that their associate pastor, Emily Freeman Penfield would be leaving at the end of the year to become senior pastor at Church of the Reconciler. There had been no consultation with Church of the Reconciler about this appointment, and no announcement was made at Reconciler. We only found out when people began to call us to ask us what we thought of the appointment. In fact, Lillian Eddleman, who had been appointed associate pastor in June and became the only pastor in August, did not know that a new senior pastor was being appointed before the public announcement was made at Highlands. We had made our opposition to the idea of an appointed board clear. Now the effort was moving forward without the pretense of following any procedure. The lay leadership was to be dismantled and replaced with a board, agreed upon between Lillian Eddleman and Ron Schultz. Although there had been no charge conference to change leadership, and although the much-discussed appointed board had not been set up, we were told that there was no leadership of the church and that we were in transition. Marti Slay was told she could no longer continue to do the welcome during worship on Sunday mornings unless she stopped introducing herself as chair of the board. The leadership and members of the church who had built this vibrant ministry had been completely disenfranchised. One of the vital activities of our church before April 1 was our Wednesday night prayer service. It was a time when the pastors would update members on the latest celebrations and problems in our ministry. Upon removal of the Higgs, Wednesday night prayer meetings were suspended. Feeling the need to spend time together in prayer for our church, several members decided to start back with our Wednesday night programming. Neither the interim pastor nor the associate pastor, Rachael Martin, however, was able to join us on Wednesday night. And the group which wanted to gather — although long-time, very active members of the church — was no longer deemed trustworthy enough for keys to the building. So we began to convene in the home of one of our members. In essence, we were a group in exile from the church we had worked together to build. When we received news of a new associate pastor following annual conference, we invited her to join us on Wednesday night and requested the church be made available to us again. The associate pastor (Lillian Eddleman) did attend one Wednesday night. After that, arrangements were made for us to get into the building, but still, the pastors did not attend. Without regular, pastoral reports on Wednesday night, there was no longer a connection between the day program and Wednesday night group. Between the removal of the Higgs, the discontinuation of Wednesday night programs altogether for a period, followed by their being resumed off location, and then brought back home but clearly not endorsed or valued by pastoral staff, attendance on Wednesday night suffered. Attendance had dropped to a small, core group of members who continued to hang on to the vision of the church and maintain a study group that supported the ministry. Later, we would be accused by the associate pastor of turning inward and clinging to each other, with no apparent understanding of the dynamics of the group prior to April 1 or afterward. This is one of many examples of our not being heard in this process. In addition to efforts by the church leadership to get information or to meet with the district superintendent, church members — knowing that some kind of complaint had to have been made against the pastors — also made an effort to meet with the district superintendent. They were told the DS had no time to meet with them or to hear what they wished to say. As one member pointed out, “he had time to hear the complaints; why doesn’t he have time to hear from the rest of us?” There was no answer to that question forthcoming. To our knowledge, we are not aware of ANY member of the church, other than the complaining parties, who was interviewed during the ‘investigation’ of the complaints. Once the DS met with the Staff-Parish Committee and the finance chair, no requests were granted for meetings with the district superintendent by members of the church. May 2011. 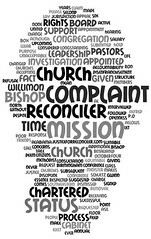 Church leadership was denied opportunity to lead; secrecy continues. Monday, May 9, 2011. Concerned that the continuing confusion, suspicion and unfounded accusations were taking a serious toll on the church’s sense of community, the church leadership called a meeting of the Staff-Parish Relations Committee to address unity within our congregation. The Discipline clearly lists ‘building unity’ as one of the top tasks of the SPRC. The interim pastor agreed, but then we received an email from Ron Schultz forbidding us from meeting. In the email, Ron said he would meet with the committee “soon” to brief us. To this date, despite repeated requests, Ron Shultz has still not met with this committee nor any other at Church of the Reconciler. Friday, May 6, 2011. 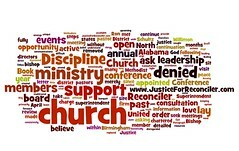 Mary Jones, lay leader and founding member, received an email from interim pastor Bud Precise. Under orders from Ron Schultz, she was to bring the church van (which had been kept at her house for over a dozen years) back to the church. When we first got our van, and the other vans over the years, the board had determined that keeping a vehicle on the street in downtown Birmingham would invite vandalism. Our vans had always been kept off-site. Mary had a van which she used on Sunday morning to pick up children near her home and bring them to church for Sunday school and worship. After we served them a hot lunch, Mary would drive the children home and keep the van until the next Sunday. Ron Schultz made the determination to have the vans stored at the church without consulting any of the leadership or other members as to why we kept our vans off-site, and without considering the problems that would be created by the change in policy. Mary would have to drive an extra hour or more each Sunday to pick up the van and return it. She was already dedicating more than four hours every Sunday to the church, in addition to the hours she spent volunteering during the week in the kitchen and the clothes closet. In addition to the logistics issues this change raised, many of us feared that the vans would not be safe. Indeed, within three weeks, the tires on all three vans were slashed one night, rendering them un-useable, since we didn’t have funding for new tires. It was weeks before we could get the vans running again, and it cost our ministry, always cash-strapped in the best of circumstances, money which could have been saved if we had been consulted and brought into the decision.